Yes, that headline is correct, and I’d love to be able to say I was the one who found it. I didn’t, but the next best thing is for a friend of mine to have dug it up. He did, and I was able to see it and hold it myself. My friend, whose name I won’t mention here, found it in a location I also won’t mention here. But I can say that it was found deep in a muddy waterside trash dump and, for him, it was the thrill of a lifetime. 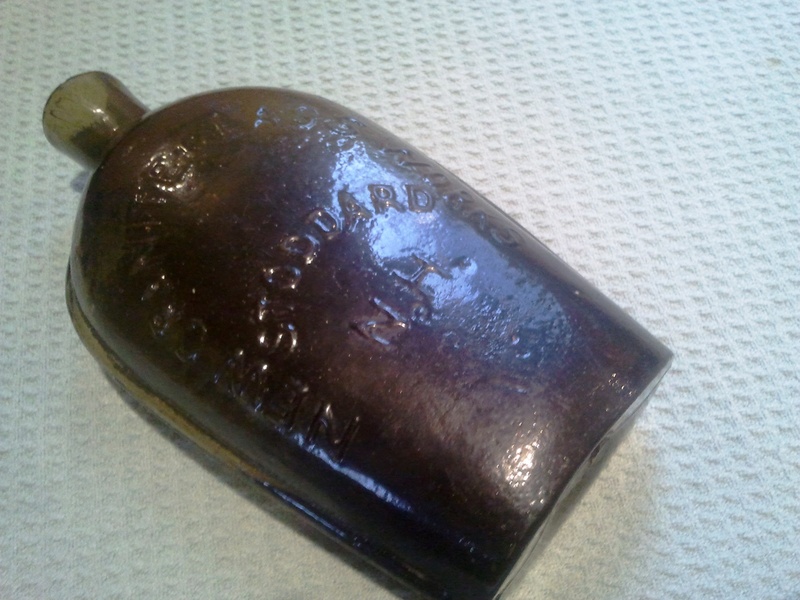 He had dug this site in years past, and found the base to one of these extremely rare “Stoddard Flag flasks” about 10 years ago. Then, a few years after that, after many more trips, he found a shard to a second one. He surmised that there had to be a whole one that survived somewhere down there, buried in the layers of muck. And it became an obsession. And I can tell you from experience that it can be a lonesome quest, digging in deep mud, looking and feeling somewhat insane, not knowing or even expecting that you will find what you really after. So, when I got news that the impossible had happened, and that he had actually found a whole one, completely intact and in perfect condition, I was happy for my friend and I felt buoyed by his success, as I’m sure all bottle diggers and divers feel; knowing that there are still amazing treasures to be found out there, with just a little—OK, a lot—of resolve, persistence and some luck. 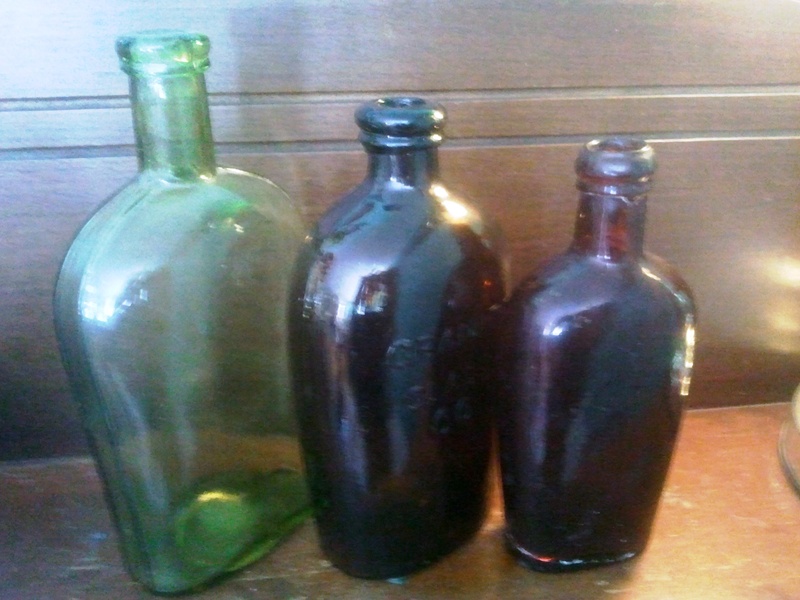 Admittedly, the bottle he finally uncovered is not the Holy Grail for all New England collectors. But it is not unreasonable to call it that for him. I know he considers it to be one. It is pint size, standing a bit more than seven inches tall, with an open pontil scar base, and in a classic New England olive-amber coloration. 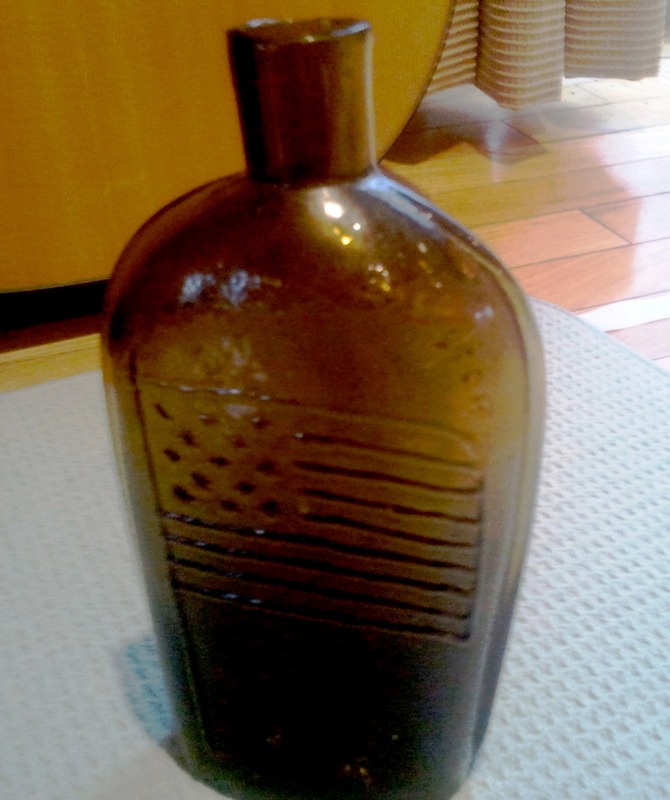 One side of the flask is embossed “NEW GRANITE GLASS WORKS STODDARD NH” and the reverse is embossed with an amazing 13-star American flag. It is a rare and valuable piece of Americana, and it had been lying deep in the mud for about 140 years. 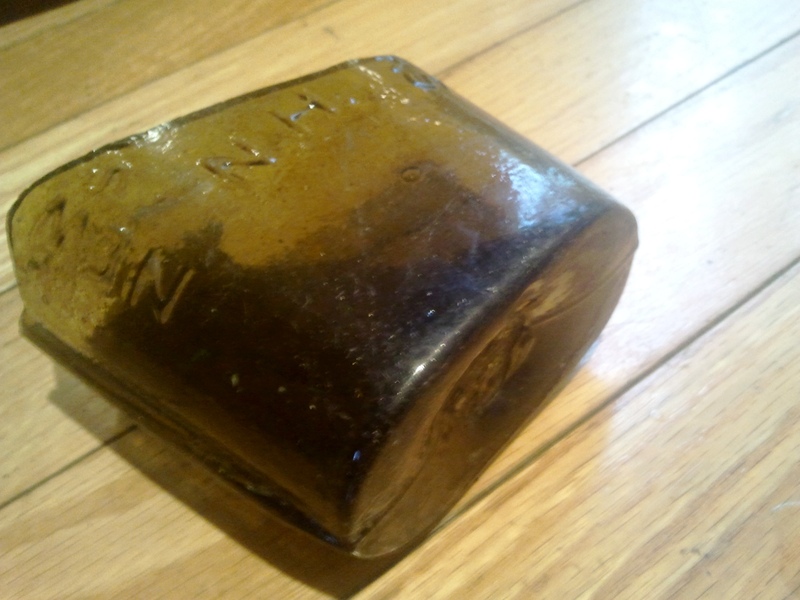 It blown at the New Granite Glass Works in Stoddard, N.H., between 1861-71. Certainly, the form and overall presence of this flask makes it as something special, even to a casual collector or lover of history. But the collector value of this rarity ranges puts it a little pout of the range of the casual collector. It values between $12,000 and $20,000, depending on condition. A similar example of the flask sold late last year for more than $14,000. One of my own greatest bottle digs happened 17 years ago, when my daughter Annie was born. I was giddy at the birth of my first child, and the day we brought her home from the hospital, my wife put her up in the bassinette and I decided to go for a bottle dig to burn off some energy. There was a spot about 200 yards from my front door that I had driven by hundreds of time. It was right next to the road, and I figured that a couple of old buckets on the surface of the ground would have been inspected and dug through by some bottle digger decades ago. Nonetheless, I informed my wife that I had to “go find Annie a bottle” and headed out the door. It weird to try to describe how excited you feel when you uncover a rare piece like that, so you’ll just have to imagine. I presumed it would be a wonderful but broken bottle, and when I pulled it out, sparkling and in mint condition, I charged back to my van and sped home. I honked the horn as I came in the driveway, startling my wife inside the house. 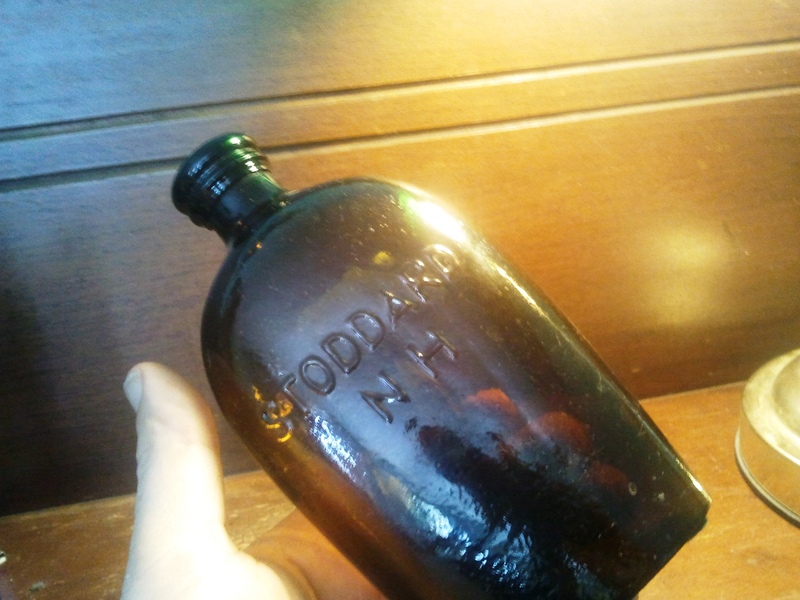 She met me at the door as I stood on the steps outside, holding the bottle so that the words “STODDARD, N.H.” were facing her. She didn’t know its exact value, but she knew enough to know it was a great find! I had been gone for less than five minutes. Its value is between $700 and $1,400. It is referred to as a “lettered Stoddard flask” and reads completely “Granite Glass Co. Stoddard, NH.” During the 1860s and ’70s, the early glass manufacturers in Stoddard, N.H., crafted some of the most highly sought-after American-made glass bottles. “Who gave you that flask?” she asked skeptically. “I just dug it for Annie,” I beamed.